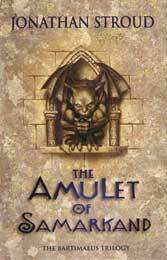 The djinni Bartimaeus is summoned by a young magician, Nathaniel, and sent off to steal the Amulet of Samarkand from the sinister Simon Lovelace. All sorts of trouble ensues. Winner of a Boston Globe/Horn Book Honor 2004 (USA). 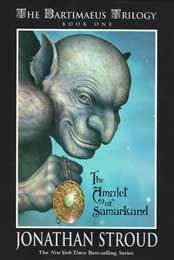 Winner of Lancashire Children's Book Award 2005 (UK). Short-listed for the British Book Awards, 2004; the WH Smith Teen Choice Award (UK) 2004; Deutscher Jugendliteraturpreis (German Youth Literature Award) 2005. "Not since Gulliver's Travels has a children's writer managed to combine a thrilling tale of magic and adventure with such deliciously pointed comedy… Stroud's sinister world is imagined in baroque and energetic detail…"
"Drama, humour and hypnotically engaging storytelling"
"the truly original touch is the way Stroud alternates Nathaniel's story with the djinni's own knowing and irascible first-person narrative"
"One of this year's most inventive and ingenious novels…Both the djinn and the boy exist in a world described with great imaginative detail…The action-packed adventures of Nathaniel and Bartimaeus…are sustained over nearly 500 pages by the immensely enjoyable characterisation. The narrative slips skilfully from first person to third and back and Bartimaeus's voice is laugh-out-loud sassy, while Nathaniel's story has an engaging poignancy as he tries to prove himself in a world in which he has always been despised." "What a delight… is The Amulet of Samarkand. Jonathan Stroud's cracker, the first of a trilogy (yes, more, please) following the adventures of a middle-ranking djinni in (another) dystopian alternative future London is pure enjoyment from beginning to end…Almost purely amoral, if not downright wicked, the character of Bartimaeus manages to convey the benefits of thoughtfulness, politeness and kindness by glorying in their converse. A tonic for anyone age 12 and up."